I’ve often been told that looks aren’t everything. Before I start to wonder what it is about me that reminds people of that platitude, let me tell you about Dream Quest. Playing games can alter your cognition. When I got into Half Life 2, I started noticing all the ventilation grates I could crawl through if I really wanted. Shadow of the Colossus inspired a love of nature that I never had growing up, immersed as I was in the indoor world of books, games, and writing. And if I spend long enough playing Japanese role-playing games like Final Fantasy, Xenosaga, or even Dark Souls, I start to have grinding dreams. In my dreams, I return to the game world with the sole purpose of running circuits through the dungeon, eking out a gruelingly slow reward of XP and gold so that I can finally face the next boss (who is hopelessly above my level) and progress the story. Don’t be afraid to eat the squirrels! Every game begins with some variation on this message. Boy howdy is there a lot to unpack here. First, none of the levels really have names; this one’s just “A Strange Place,” with deeper levels of the dungeon dubbed “A Stranger Place” and “The Strangest Place.” This naming scheme completely ignores the actual content of the environment; “A Strange Place” could be the water level, as above, or the air, forest, dungeon, graveyard, or lava levels. No matter how many times you pass through them, you always seem surprised to be there, which makes a kind of sense considering the layout and population of the levels change in true Roguelike fashion with every play. Yet there’s some familiarity to the horrible imp’s greeting: “So nice of you to join us, master,” as if he’s been expecting you. He seems to know why you’re there—to kill monsters and loot corpses—even if you don’t. Every level up brings new power and new choices. And this routine will become very familiar as you descend into the dream again and again, resurfacing every half hour or so after suffering an ignominious fate at the hands of a wraith, medusa, ghoul, or goblin mechanist. It’s the waking version of the grinding nightmare, and its repetitive and addictive nature will slowly worm its way into your subconscious until you’re having Inception-style Dream Quest dreams of your own. Let’s step back from the story, however, and describe the game’s mechanics. 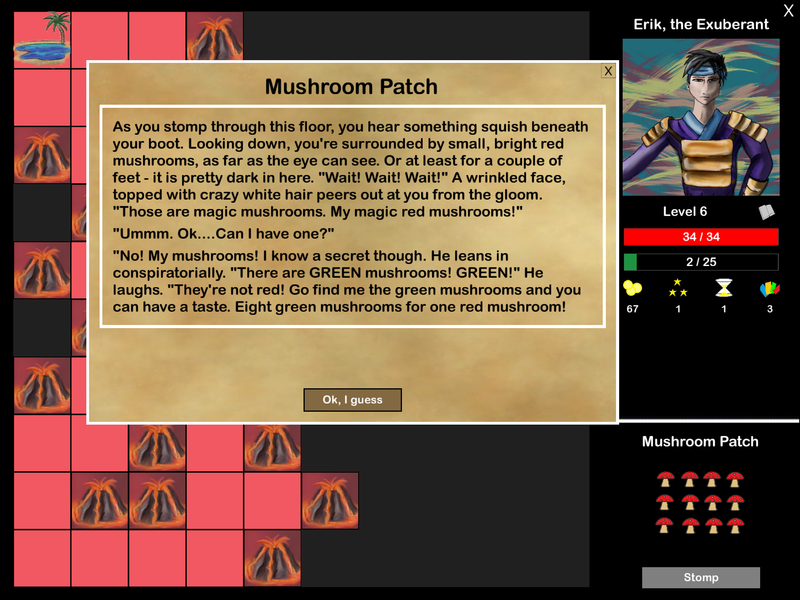 Dream Quest is a hybrid between a deckbuilding card game and a Roguelike video game. The former means that you’ll start with a small deck of weak cards and spend the game gradually improving it. 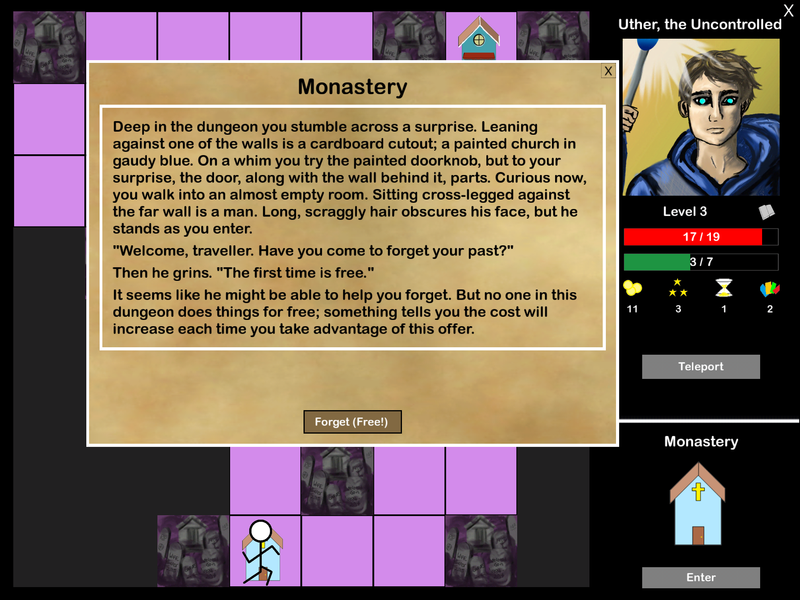 In this case, you’ll be adding cards received from level-up bonuses, treasure chests, and shops (Gouda’s Gummy Goodness, “Guaranteed to expand your mind!”); enhancing cards at coin-operated anvils; “forgetting” cards at monasteries; or trading them in for unknown abilities at the in-dungeon headshrinker, Hillditi’s House of Happiness. The Roguelike part suggests an experience built around procedurally generated dungeons, merciless difficulty, and permadeath—every fight has the potential to end your adventure, and when it does, there’s nothing for it but to start back at the entrance of a new, different dungeon. Dead is dead; long live dead. 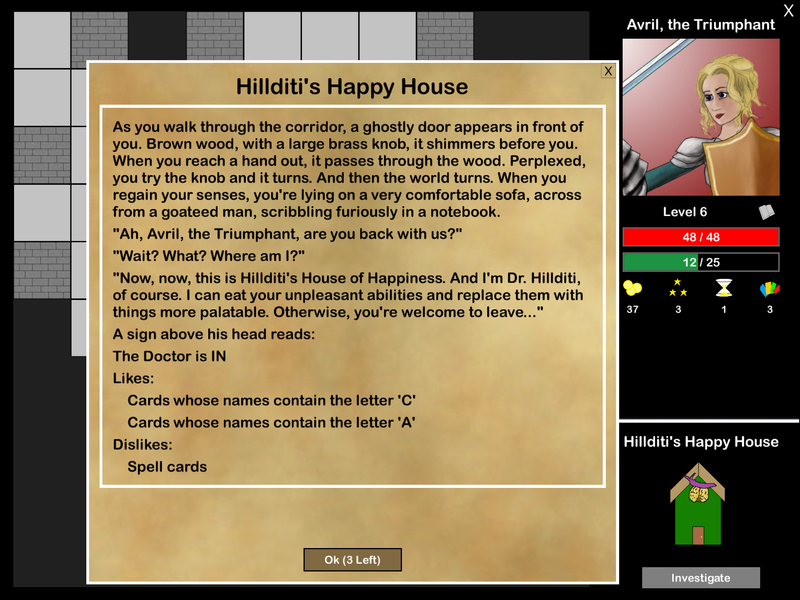 Trade in unwanted cards at Hillditi’s Happy House. 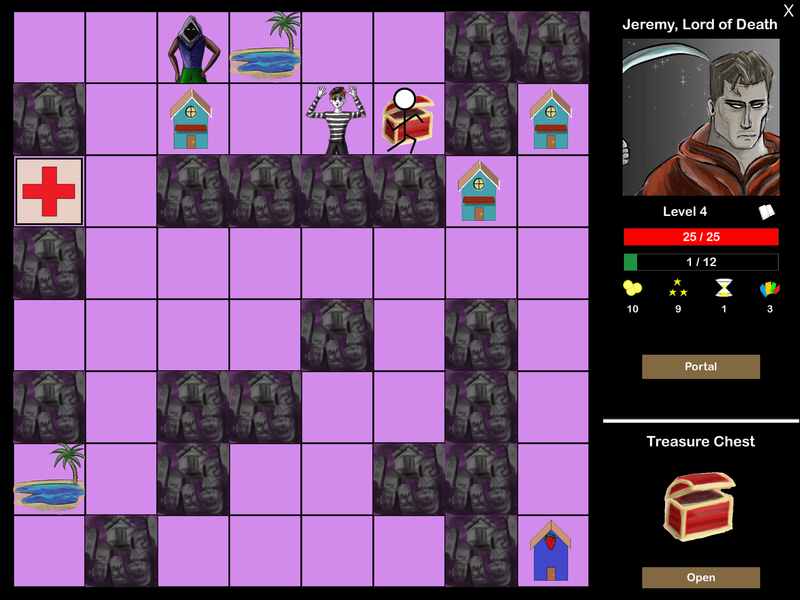 On the surface, the gameplay is as simple as the hand-drawn interface (your avatar on the dungeon map is a stick figure, for Pete’s sake). Explore a mazelike dungeon grid, gradually revealing it one square at a time. Monsters don’t attack you while you’re exploring, but you’ll still need to fight them eventually—either for their XP and gold or just to get past them. 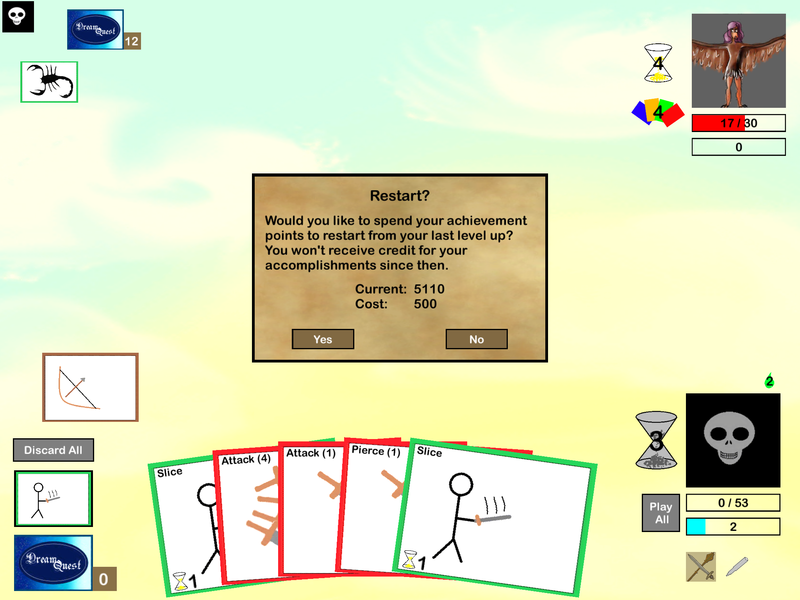 Entering combat takes you into a one-on-one card battle against the enemy’s deck, specifically tailored to its type (there are 73 entries in the bestiary, including the 18 bosses) and level. Cards come in six types: attacks, which deal physical, elemental, or piercing damage; spells, which have a variety of effects, from fireballs to healing and shields, but require mana to be played; mana cards, which replenish mana and might have bonus effects like a free card draw or a temporary shield; action cards, which are as varied as spells but consume action points that are automatically replenished each turn; prayers, which offer a delayed effect that scales based on how long of a timer you put them on; and equipment, which goes into a special equipment slot and provides a passive bonus for the rest of the fight. But like any good dream, it’s deeper than it sounds; there are over 300 cards unique cards, all of which synergize with each other and with your class’s abilities (unlocked with each level up). And since this is a Roguelike—since the treasures, enemies, and other dungeon features are randomized with each play—you will never make the same deck twice. Dungeon exploration looks something like this…. That isn’t even taking into account how differently each class plays. Your class determines not only your special abilities and starting deck but also the likelihood you’ll encounter certain cards, so that warriors are much more likely to find attack cards, wizards to find spells and mana, et cetera. Each of the four basic classes lends itself to a relatively straightforward strategy: the warrior stocks almost entirely attacks and equipment, allowing her to focus on hitting things repeatedly until they die; the wizard specializes in spells and mana; the priest plays defensively, with healing and blocking spells that let him wait out the timers on his prayer cards; and the thief can chain together dozens of low-damage, card-drawing actions like Circle, Slice and Jab before finally finishing the enemy off with a Backstab, which deals damage based on the number of actions in play. But the advanced classes are where the real fun lies. The monk can Meditate every few combats, forgetting (permanently removing) a card from his deck, and at higher levels, his Diamond Fist ability makes all his damage piercing. The paladin automatically upgrades a random attack card from her deck every two combats. The necromancer can use his Soul Siphon card on weakened opponents to permanently increase his base mana, and at higher levels he can spend his own health to draw additional cards with no limit. The samurai heals fully every time he defeats a stronger opponent. And the druid essentially builds two decks during the game. Her wolf form removes all mana and spell cards from her deck and can build up high levels of poison damage with the Rend attack; her druid form removes all attack cards from her deck, relying entirely on spells and her summoned animal companions, which have a random effect; she switches between forms after every battle, so you have to think carefully about not just which enemies you fight, but when. 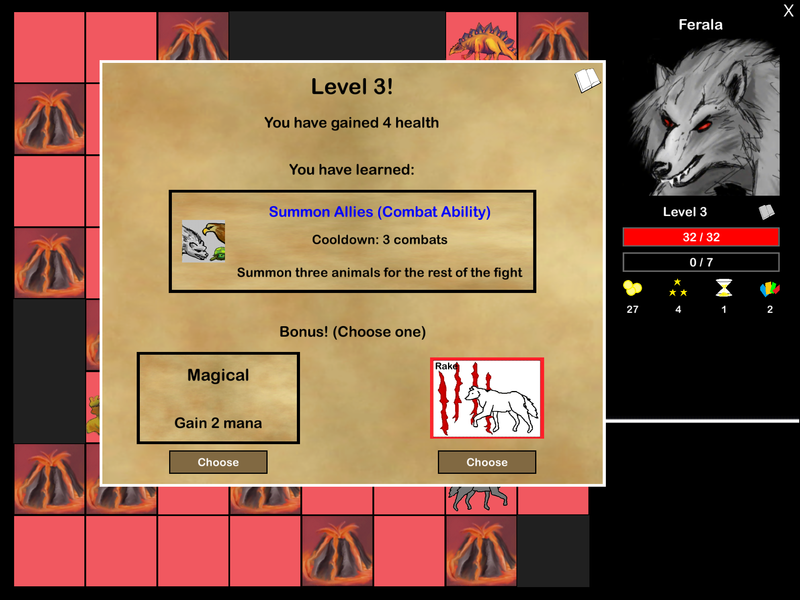 …and combat looks like this. As serious as the strategy is, the package surrounding it is equally absurd. The shops are made of gingerbread and gumdrops; the monasteries and anvils are two-dimensional replicas. You might battle zombies one minute (“Like a toddler, tries to make friends by biting”) and mop-wielding brownies the next (“Normally peaceful, but you’re in the way of her cleaning”). Bosses include a unicorn (“You’re not really her type”), a widow’s peaked vampire (“Not at all sparkly”), a card-copying mime (“Silent but deadly”), and a genie who forces you to pick from three terrible “wishes,” like replenishing his health or filling your deck with curses, frequently during the fight. There’s a sidequest involving magical mushrooms. It has all the trappings of something cobbled together by a bored teenager, but the gameplay is polished enough to earn a glowing recommendation from Magic: the Gathering creator Richard Garfield. 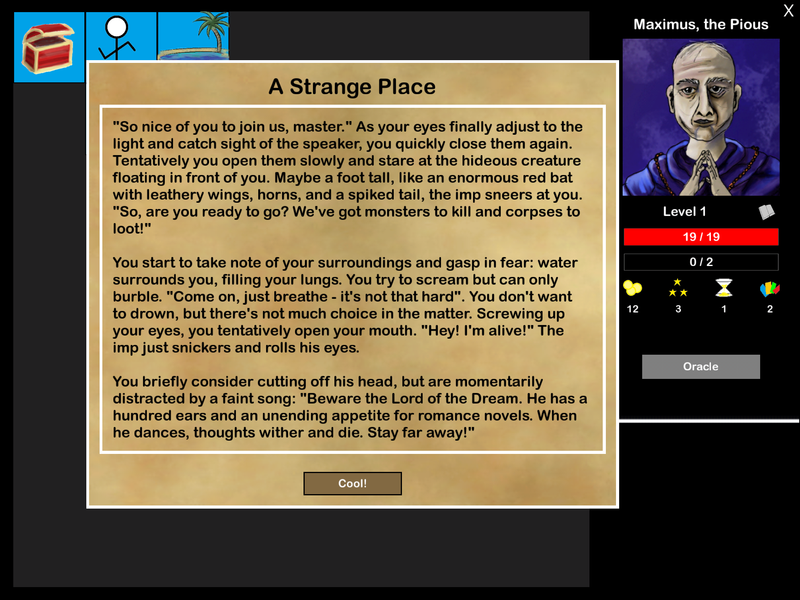 Like many Roguelikes, Dream Quest offers dual incentives to drop back into the dungeon and get your face smashed in by a titan. The first incentive is the achievement system, which gradually unlocks new content—in the form of new cards, classes, and talents (passive enhancements choosable at the start of each dungeon floor)—as you meet new milestones. The first of these are easy to accomplish: complete the first floor of the dungeon once as each of the four basic classes, kill 5 fairies, die once. Others are inevitable, given enough plays: walk 26,219 steps, deal 20,000 damage, encounter every type of monster at least once. Some of them—clear the dungeon once with every class, defeat the final boss—are probably better purchased using the achievement points that are awarded each time you die. The second incentive is the challenge itself. Dream Quest is hard. I don’t mean Nintendo hard or Dark Souls hard; this is another level. I’ve never considered myself a particularly skilled gamer, but I have about thirty years’ experience. 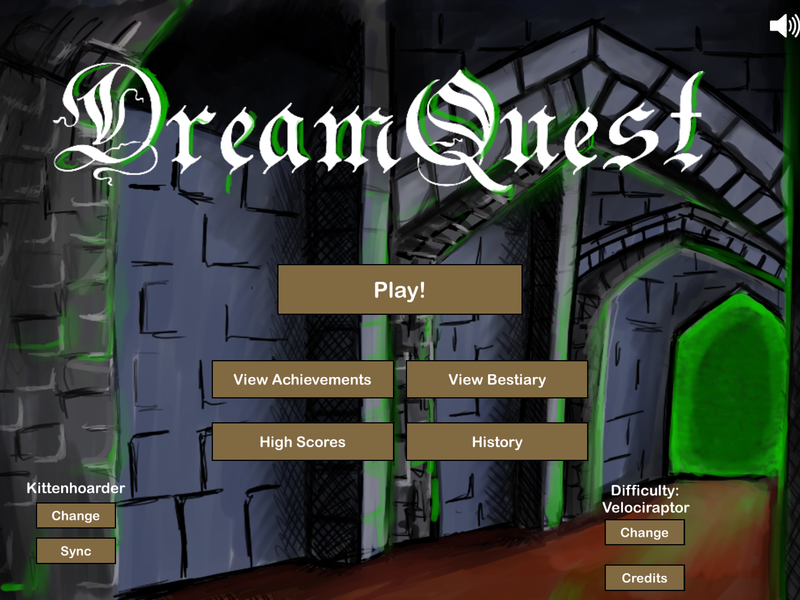 I’m not sure how many times I’ve played through Dream Quest; update 1.08 in October 2014 added a game history so that you can replay specific dungeon layouts to improve your strategy, and I’ve played 136 games since then. I think I’ve seen the final boss only once, and even that may have been a dream. My characters typically die somewhere on the third floor of the dungeon if they didn’t already perish at the hand of the second floor boss. But that level of challenge can be addicting. There are only a few achievements left that are within my reach; the rest will require some grinding. But with 11 of the 14 classes unlocked, I still have plenty of game to explore. Forgetting cards can be just as important as gaining them. A defining feature of most Roguelikes is that they engender caution. Every step must be carefully weighed to avoid blundering into a deadly trap or monster. Dream Quest does the same thing—all combat, with one important exception, is voluntary, and not all classes or decks are suited to take on every enemy, so you have to pick your battles. 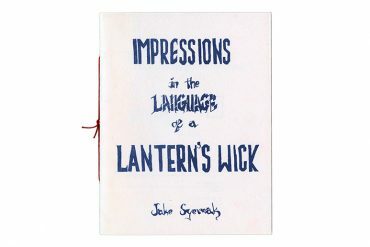 But Whalen has managed to translate the same tiptoe-through-the-darkness feeling to the deckbuilding element of the game. It’s easy to get carried away and scoop up every new card you find at the bottom of a treasure chest or can afford in the shop, but doing so is like picking up every wheel of cheese in Skyrim; your deck will collapse under its own weight before you reach the first staircase. Every addition to your deck must be considered, especially the free ones. Unfortunately, there isn’t much hope for a follow-up to Dream Quest, since the sole designer Peter Whalen has been headhunted by Blizzard for their Hearthstone development team. But that’s okay; there’s enough content here to last until long after that contract expires. On that count, you can rest easy. One last word of advice: if you see a squirrel, you know what to do.